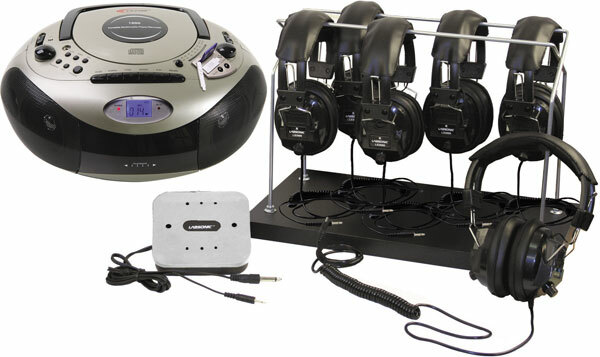 Listening centers include 1x 1886 Spirit Boombox, 6 or 8 Labsonic LS3000 Headphones, 1x JB8S 8-position jackbox, and with or without a headphone rack. 3.5mm plug works with all computers, tablets, cd players, and more. Includes a 1/4” stereo adapter to use with older equipment such as jackboxes in language labs. Triple shielded straight/coiled/straight cord is 4.5ft which is good for tablets and laptops, and will extend to 10ft for reaching the back of computers or language lab jackboxes.